To see traveler tips, reviews, other places to visit, and other tourist information, refer to the Ponta Delgada holiday planner. Toronto, Canada to Ponta Delgada is an approximately 9.5-hour flight. The time zone difference when traveling from Toronto to Ponta Delgada is 4 hours. Traveling from Toronto in May, Ponta Delgada is somewhat warmer at night with lows of 17°C. On the 21st (Mon), you're off toFatima. Fátima is a civil parish in the municipality of Ourém, in the Portuguese Santarém District. Kick off your visit on the 22nd (Tue): tour the pleasant surroundings at Praia da Nazare and then contemplate in the serene atmosphere at Convent of Christ. On the 23rd (Wed), you'll have a packed day of sightseeing: kick back and relax at Praia do Norte, then get great views at Miradouro do Suberco, then make a trip to O Sitio, and finally make a trip to Obidos Village. To find photos, more things to do, maps, and more tourist information, go to the Fatima trip planner . You can do a combination of flight and bus from Ponta Delgada to Fatima in 6 hours. Alternatively, you can do a combination of flight, train, and bus. You'll lose 1 hour traveling from Ponta Delgada to Fatima due to the time zone difference. Traveling from Ponta Delgada in May, expect a bit cooler with lows of 13°C in Fatima. Finish your sightseeing early on the 24th (Thu) to allow enough time to drive to Lisbon. Venture out of the city with trips to Sintra (Quinta da Regaleira & Park and National Palace of Pena). The adventure continues: meet the residents at Lisbon Oceanarium, take in the spiritual surroundings of Jeronimos Monastery, steep yourself in history at Castelo de S. Jorge, and explore the world behind art at Museu Calouste Gulbenkian. Discover how to plan a Lisbon trip in just a few steps with Inspirock's itinerary builder. Traveling by car from Fatima to Lisbon takes 1.5 hours. Alternatively, you can take a bus. Expect a daytime high around 28°C in May, and nighttime lows around 15°C. Cap off your sightseeing on the 28th (Mon) early enough to go by car to Albufeira. Start off your visit on the 29th (Tue): tour the pleasant surroundings at Praia marinha and then kick back and relax at Nossa Senhora da Rocha Beach. 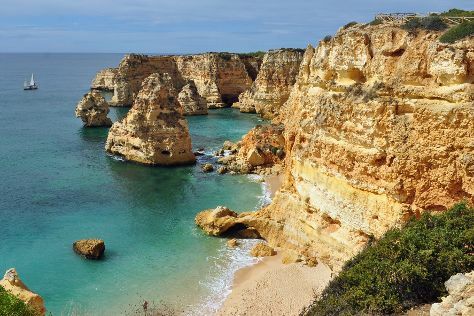 Get ready for a full day of sightseeing on the 30th (Wed): kick back and relax at Praia do Peneco, enjoy some diversion at Hot Wheels Raceway, then tour the pleasant surroundings at Algarve, then kick back and relax at Praia da Senhora da Rocha, and finally kick back and relax at Castelo Beach. For more things to do, maps, and other tourist information, read our Albufeira day trip website . You can drive from Lisbon to Albufeira in 2.5 hours. Alternatively, you can take a train; or take a bus. May in Albufeira sees daily highs of 28°C and lows of 18°C at night. Cap off your sightseeing on the 31st (Thu) early enough to travel to Madrid. Madrid is known for museums, nature, shopping, nightlife, and historic sites. Your plan includes some of its best attractions: see the interesting displays at Museo Nacional del Prado, explore the galleries of Royal Palace of Madrid, explore the activities along Retiro Park (Parque del Retiro), and don't miss a visit to Puerta del Sol. To find traveler tips, maps, photos, and more tourist information, read our Madrid tour itinerary maker tool . Traveling by combination of bus and flight from Albufeira to Madrid takes 5.5 hours. Alternatively, you can do a combination of bus and flight; or drive. You'll lose 1 hour traveling from Albufeira to Madrid due to the time zone difference. Traveling from Albufeira in May, plan for little chillier nights in Madrid, with lows around 13°C. Wrap up your sightseeing on the 5th (Tue) early enough to take a train to Barcelona. Spend the 8th (Fri) among aquatic life with a scuba or snorkeling tour. There's lots more to do: pause for some serene contemplation at La Sagrada Familia, examine the collection at Museu Nacional d'Art de Catalunya - MNAC, explore and take pictures at Camp Nou, and browse the eclectic array of goods at La Boqueria. To see ratings, maps, photos, and tourist information, go to the Barcelona online itinerary planner . Traveling by train from Madrid to Barcelona takes 2.5 hours. Alternatively, you can fly; or drive. Traveling from Madrid in June, expect nights in Barcelona to be about the same, around 22°C, while days are a bit cooler, around 30°C. Wrap up your sightseeing by early afternoon on the 9th (Sat) to allow time for travel to London. London is known for museums, nightlife, historic sites, shopping, and parks. Your plan includes some of its best attractions: don't miss a visit to The London Eye, contemplate the long history of Tower of London, admire the masterpieces at National Gallery, and snap pictures at Tower Bridge. To find more things to do, other places to visit, where to stay, and more tourist information, read our London trip planner . Traveling by flight from Barcelona to London takes 5 hours. Alternatively, you can take a train; or do a combination of taxi, train, and car. You'll gain 1 hour traveling from Barcelona to London due to the time zone difference. Expect a bit cooler temperatures when traveling from Barcelona in June; daily highs in London reach 23°C and lows reach 13°C. Wrap up your sightseeing on the 15th (Fri) early enough to travel back home.